Roster last updated on March 29, 2019. 5601 NS/NW GP38AC 4134 01-2005 NS 06-1971 5775 35654 3,600 Equipped for remote control operation. 5602 NS/NW GP38AC 4111 02-2005 NS 10-1971 7326 35631 3,600 Equipped for remote control operation. 5610 NS/SOU (GSF) GP38 2820 10-2005 NS 03-1970 7240 36068 3,000 NS LEADER/PTC Equipped. 5611 NS/SOU GP38 2802 10-2005 NS 03-1970 7240 36050 3,000 NS LEADER/PTC Equipped. 5612 NS/SOU GP38AC 2823 11-2005 NS 04-1971 7307 37295 2,600 NS LEADER/PTC Equipped. 5613 NS/SOU GP38AC 2827 11-2005 NS 04-1971 7307 37299 2,600 NS LEADER/PTC Equipped. 5614 NS/SOU GP38 2745 11-2005 NS 09-1969 5744 35275 3,000 NS LEADER/PTC Equipped. 5615 NS/SOU GP38AC 2828 11-2005 NS 04-1971 7307 37300 2,600 NS LEADER/PTC Equipped. 5616 NS/SOU (CNOTP) GP38 2736 11-2005 NS 09-1969 5744 35266 3,000 NS LEADER/PTC Equipped. 5617 NS/SOU GP38 2789 12-2005 NS 01-1970 7240 36037 3,000 NS LEADER/PTC Equipped. 5619 NS/SOU GP38 2803 12-2005 NS 03-1970 7240 36051 3,600 NS LEADER/PTC Equipped. 5628 NS (PRRX) GP38 2895/CR/PC 7703 02-2006 NS 07-1969 7191 35332 2,600 NS LEADER/PTC Equipped. Unit has GP40 radiator compartment. 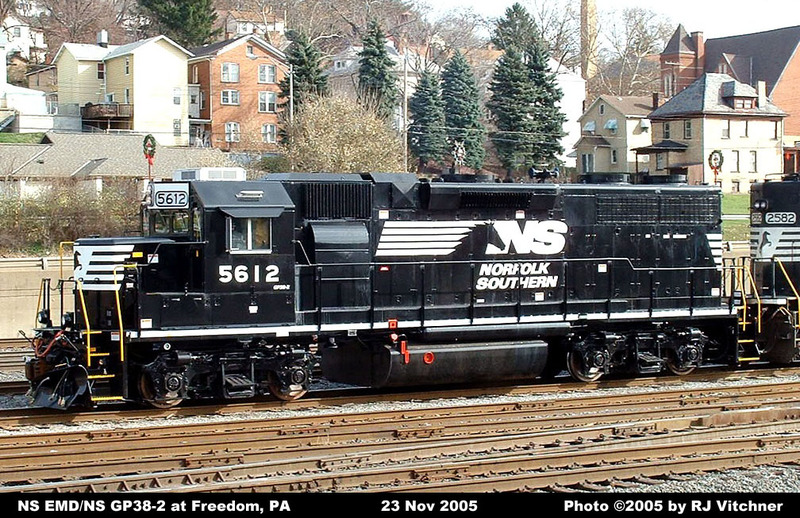 5630 NS (PRRX) GP38 2894/CR/PC 7702 03-2006 NS 07-1969 7191 35331 2,600 NS LEADER/PTC Equipped. 5634 NS (PRRX) GP38 2901/CR/PC 7712 03-2006 NS 07-1969 7191 35341 2,600 NS LEADER/PTC Equipped. 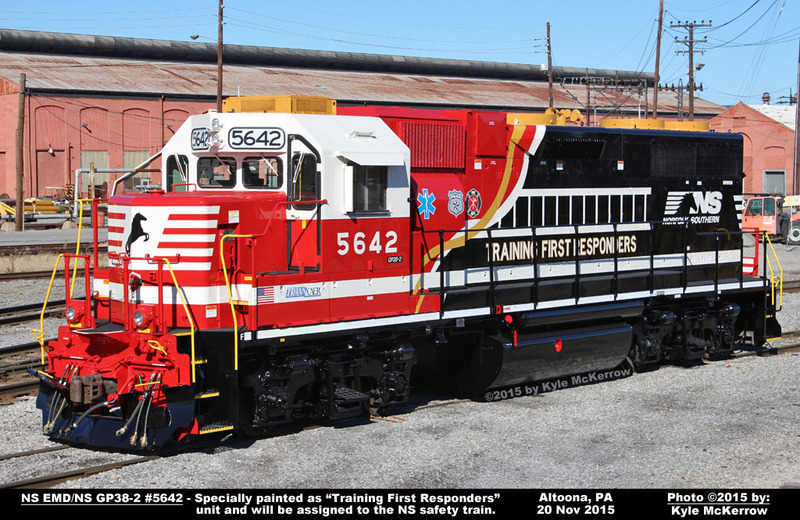 5642 NS (PRRX) GP38 2923/CR/PC 7868 05-2006 NS 01-1971 7291 36927 2,600 Painted in special Training First Responders paint scheme. 5643 NS (PRRX) GP38 2886/CR/PC 7691 05-2006 NS 06-1969 7191 35320 2,600 NS LEADER/PTC Equipped. 5658 NS (PRRX) GP38 2946/CR/PC 7903 09-2006 NS 02-1971 7291 36962 2,600 NS LEADER/PTC Equipped.